Our Policy is YES...and we'll figure out the details. There is no event too large or too small. If you need massage, we can provide it. Kneaded Energy offers chair massage at public events. This portion of our business is dedicated to running a well oiled chair massage service business offering massage therapy, stress relief and relaxation to the public at events in the form of chair massage or fully-clothed table massage. We have dedicated our lives to providing quality massage therapy to the public for 10+ years. Kneaded Energy is managed by a team of practicing massage therapists who understand quality, service and professionalism and who have the proven track record for success in business. Our business specialty is massage therapy. We understand and appreciate the professional sensitivity and the trust you are placing in our hands by asking us to provide a professional hands-on service for your business, your employees or customers that could have a direct impact to your bottom line. Kneaded Energy is owned and operated in Greensboro, NC. We work locally as Kneaded Energy, however we also offer chair massage nationally, working under the subsidiary of National Massage Network. We are, is open 7 days a week (9am-9pm Monday-Friday, 9am-8pm Saturday and 12-8pm Sunday, EST) with email, internet and phone coverage. You can reach us by phone at 336-273-1260. Our company email is: kneadedenergy@aol.com. If you call outside of these hours, we will retrieve your message and return your phone call. Health Fairs and Health Screenings - In an effort to reduce overall health insurance premiums, medical screenings are arranged for companies by national health screening and immunization providers. 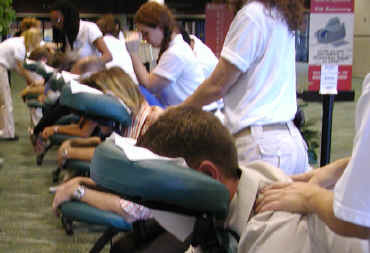 To increase employee participation, massage is used as a draw at the end of the screenings. Kneaded Energy provides the massage therapy. Outside Events, Street Fairs and Festivals - From bilingual street fairs to nationally recognized food and music festivals, National Massage Network can provide multiple therapists, in multiple major cities, simultaneously, targeted to appeal to thousands of people. Our function is to insure that we help to retain people at the event, keep attendees excited, engaged and interested, and keep everyone relaxed and peaceful. Some events directors request that we pass along marketing material at the end of each massage. Employee/Client Appreciation Days - Bring us to your workplace for annual Employee Appreciation Days or Client Appreciation Days. Massage can be used as a reward mechanism to show your employees or special clients that you appreicate their work. It says "Thank you for working hard toward our goals...Thank you for all your hard work...Thank you for your loyal patronage...Thank you for your dedication to our company". Trade Shows - For Trade Shows, National Massage Network may be contracted by the convention center, the national organization hosting the trade show or by a major vendor at the trade show. At one particular trade show we were contacted by a nationally syndicated publication to provide chair massage to attendees at multiple statewide conventions and pass out sales information about the publications. At another trade show we were given a booth and asked to keep attendees happy, relaxed and at the show for as long as possible. Another trade show we were hired by a particular company that wanted a captive audience to listen to a soft sell, sales pitch that was delivered during the massage with headphones that was interspersed with soft relaxing music. The vendor also displayed a continuous video loop that was visible to everyone standing in line for massage. Conventions - Whether contacted directly from the Convention Center or Event Center staff, or the Event Planner, Marketing Director, or Exhibitors - we can provide services, large or small for your event. whether it is a daily, weekend or weekly convention targeting thousands of attendees in multiple sites, we can handle the traffic with professionalism and ease. Most large events are prepaid and can include the cost of a member of our management team to handle coordination of the event, onsite. Sporting Events - National Massage Network can coordinate and manage specialized services for on-site sports massage to professional and amateur sporting events, pre and post event. We have the resources and contacts to cover large quantity, multi-location, simultaneous events anywhere in the U.S. and Southern Canada. And we can cover a corporate chair massage event at your company and can then recommend, place or help you to interview a local contact for an ongoing program at your company.